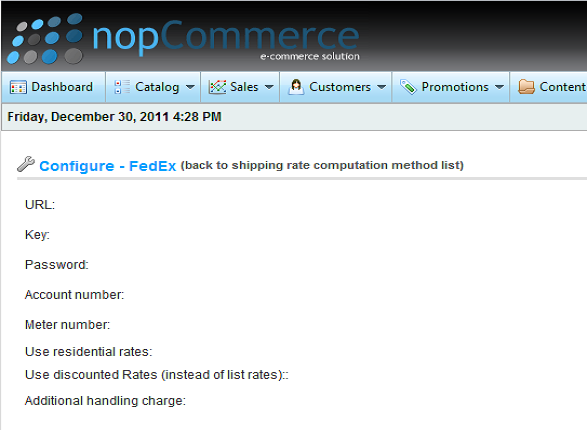 FedEx Shipping rate computation plugin has been enhanced with basic packing options. Two additional options have been added to the original. The added options send package dimensions to FedEx, wheras the original does not. b) New ability to accept ZipPostalCodeFrom, StateProvinceFrom, and CountryFromTwoLetterIsoCode from the shipping option request object. Currently, this is only supported by Shipping Director; you can conditionally calculate different shipping origins (e.g. different warehouses, or dropship). Additionally fixed, was a problem with the original FedEx plugin that did not properly handle currency conversion when the store primary currency was not the same as the origin country's currency. Also, when neither the shipping origin's currency or the destinations currency is the same as the store primary currency, FedEx would complain that "There are no valid services available. (code: 556)". This version will support this scenario for US / Canada shipping. Original - this is the default. The number of packages is calculated based on total product item dimensions. The configuration screen now has option to "send dimensions" to FedEx API (in addition to weight). But, be careful here- this still uses the original "total dimension divided by # of packages". I've posted about how that can be inaccurate and that the below cube root is better. Each shopping cart item is a separate package. Each shopping cart item's dimensions are used to create its FedEx package dimensions. This is the option that should be used with the Shipping Director when it will perform the packing. 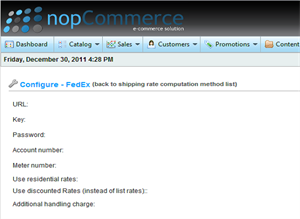 (Currently, nopC shipping plugins cannot take "packages"; thus, the Shipping Director fabricates dummy shopping cart items with "packed" dimensions, weight, and total price. ).